The Province includes many of North America’s oldest Franciscan sites. First arriving in present-day Arizona and New Mexico in 1539, the friars established missions among the Native peoples during the time of the Spanish Empire. When Spain authorized the colonization of California in 1769, St. Junípero Serra, OFM arrived to serve as presidente of new missions founded in Alta California. Serra and his Franciscan successors established twenty-one missions, stretching from San Diego to the San Francisco Bay area, For many generations, they were the primary representatives of the Catholic Church in what is now the western United States. After Mexican independence from Spain in 1821, the California missions were removed from the friars’ care and secularized in the 1830s. 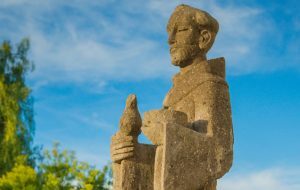 Franciscans thus began to branch out into new ministries and accept new challenges, though they remained at Mission Santa Barbara, the only mission where they have been continually present since its founding. In the meantime, Franciscan friars were fleeing anti-Catholic legislation (the Kulturkampf) in Germany and emigrating to the United States. They came first to minister in the Midwest; from there, they were sent to California to help support the friars at Mission Santa Barbara. These German friars also founded a number of rural and urban parishes in the West, and their efforts flourished. In the wake of the Gold Rush (1849), people from all over the world poured into California. The friars responded by embarking on ventures that reflected the needs of the new, burgeoning population by engaging in itinerant preaching to meet the people where they were in addition to their parish work. They were also instrumental in establishing a seminary in Santa Barbara, as well as an orphanage in central California. The Province of Saint Barbara was formally established as an entity on December 4, 1915. This new Province quickly accepted additional ministries, including Native American mission fields in southern Arizona, New Mexico, and California — sometimes returning to areas first evangelized by friars centuries earlier. Today Franciscan friars continue working closely with people of every background, ethnicity, and social / economic status in efforts ranging from parishes and retreat centers to extensive outreach programs among the poor and marginalized. Together with the entire Franciscan family, the friars seek to adapt to a rapidly changing world while remaining true to the Gospel and to the legacy of St. Francis.